Looking for an invoice template that will work for your law firm? We've got you covered! Do I need more than just a lawyer invoice template? Looking for a lawyer or attorney invoice template? You've come to the right place! We know that attorneys are incredibly busy and put in long hours working on their cases. There's no reason to add on more time trying to get payment from your clients or creating invoices from scratch. There's also no reason to settle for just a basic invoice template. ZipBooks has so much more to offer. We have even created invoice templates that are linked to a time tracker so you can track just how long you spend on each case and add it directly to the invoice. 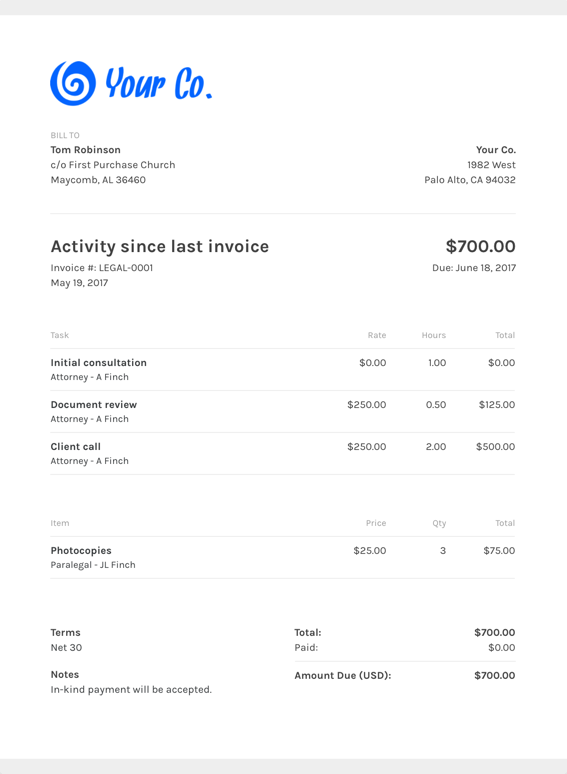 What should I include on my lawyer invoice template? One popular feature of ZipBooks invoice templates is that you can save default settings for your invoices (like company logo and header and footer color) once you nail down the invoice details. Using ZipBooks for your lawyer invoice means never sending off an invoice without your own company’s information on it (oops!). We’ve collected data from tens of thousands of invoices and use it to score your invoice based on what information you include so you’ll get you paid faster. Why should I use ZipBooks’ lawyer invoice template to create and send my lawyer invoice?